I have new classes coming up in May at Yarn Shop Santa Cruz. Call the shop at 831-515-7966 to register! Every first Sunday of the month 10am-11:30am, this month May 7th. Join the fun, while filling your drawer full of hand-knit socks as many other knitters have done via the popular #operationsockdrawer on social media. This month we’ll work on the pattern Tip Toe Up. During the monthly meeting we will go over the selected pattern and review any new techniques or tricky steps. Members will vote on what sock pattern we will tackle next. You will have a chance to cast on and get started but not before we “show and tell” our FS=finished socks! This is for the total beginner or if you need a refresher. Make a handy mug rug to go under your favorite hot drink. You will learn how to cast on, knit, purl, and bind off. We’ll also discuss how to read a simple knitting pattern and practice identifying and fixing your mistakes as you go. In January I attended my first TNNA show and met the lovely couple who own Twisted Owl Fiber Studio. They had some perfectly glorious yarns and when I met them again at Stitches West, I ended up with a lovely skein of 2-ply sock and a set of mini-skeins. I came home with them and the Vedru Shawl flew off my needles so fast, it almost knit itself! 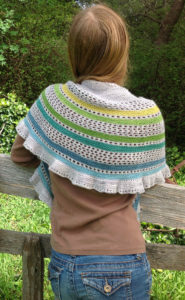 Vedru is a classic top down crescent shawl design perfect for using a special collection of mini-skeins. There are no complex stitches or purling in this lovely, peaceful garter stitch lace knit. The design works well with solid yarns, tonal yarns, or yarns with subtle variegation. 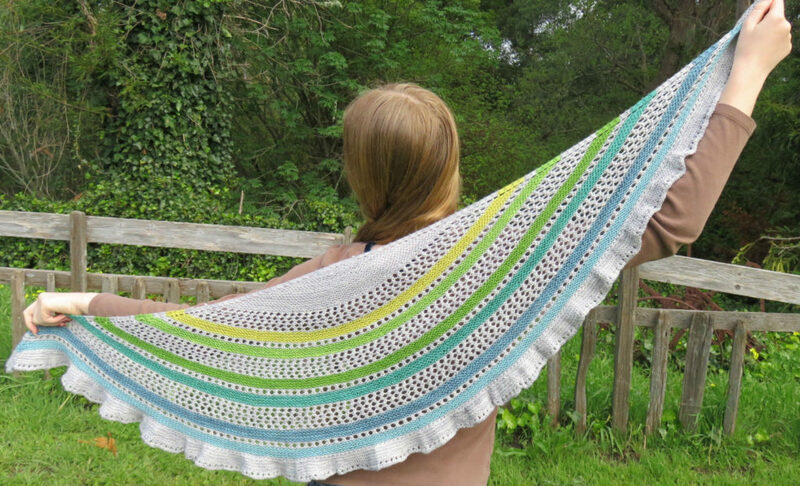 The pattern includes directions for two sizes with six or eight stripes. Line by line written directions are included. Gauge is not critical to this project but will affect the amount of yarn used and the overall size of the project. You can purchase this pattern on Ravelry in my shop. 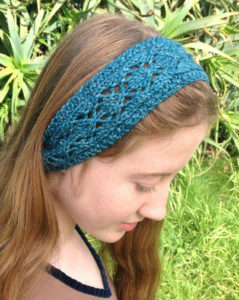 This weekend I released a new pattern– a simple lace headband that can use up a bit of worsted weight yarn you have leftover from another project. It’s an elegant little gift that you can complete in a few hours and the pattern includes information to custom fit the size. Both written and charted instructions are included for the lace pattern. You can find the Diamond Lace Headband on Ravelry and it is free through April 20th when you use the coupon code “SPRING” at checkout!